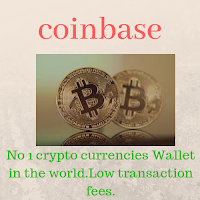 Coinbase is a very trusted and world's No 1 crypto currency digital wallet.Coinbase is available more than 30 countries since 2017.This wallet deals in different currencies like Bitcoin,Bitcoin classic,Ethereum,Ethereum classic and Litecoin.This walletis very easy to use and it's rates are very low. This digital exchange is very easy to use.First of all Click Here and go to it's main page.Click at the Sign Up button after it there is open it's sign up form form.It is very simple.At the top of form you see two options Individual and Business leave it at the Individual.Fill the form give your's original First Name in second box give your's Second Name after it give your's Email Address and choose a Password ( Remember this password this password you give when you login).Solve the simple Recaptgha.After it check at the box of User Agreement.At the last click at the Create Account.Company send mail to you for conformation.Open your's mail and click at the Conformation Address.There is open the other window of Coinbase you simply login on your's account give the Email Address and Password company send you Email for security conformation.Confirm it from your's Email account now your's account is ready to use and you reached at your's Dashboard. After open the Dashboard click at the Tools after it click at the Create New Address there is appear a address this address use for deposit money in your's wallet.If you send money anyone copy his wallet address and open your's Coinbase dashboard click at the Accounts there is open a new window.Now click at Btc Wallet Send option.Than open other window paste Btc address in Recipient box.Enter amount in USD or BTC who you wants to send anyone.Than click at the Continue.After it confirm it your's money send at the address you enter.You can open your's wallet in other available digital currencies with same process.For open free account click at the banner. If you have any problem Plz write us in comments box and send us we will try our best to solve your's problem. If you join this company plz share with us your's experience.